Cut bell pepper in half lengthwise; discard seeds and membranes. Place pepper halves, skin sides up, on a foil-lined baking sheet; flatten with hand. Broil 15 minutes or until blackened. Place in a zip-top plastic bag; seal. Let stand 10 minutes. Peel and cut into strips. Heat a large nonstick skillet over medium-high heat. Coat pan with cooking spray. Add garlic, and cook for 1 minute. Add mushrooms; cook 4 minutes or until liquid evaporates. Add bell pepper, crushed red pepper, and the next 5 ingredients (through tomatoes). Bring to a simmer; cook for 7 minutes. Stir in asparagus; cook 4 minutes or until crisp-tender. 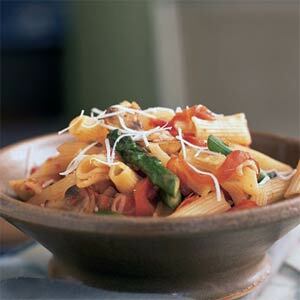 Combine mushroom mixture, pasta, and 1/4 cup cheese in a large bowl, tossing well to combine. Sprinkle remaining 1/4 cup cheese over pasta.